January 21, 2017 January 21, 2017 Dan O. This can happen to moms everywhere! Just get off of our backs already! Jeez! Julieta (Emma Suárez) lives in Madrid with her daughter Antía. They both suffer in silence over the loss of Xoan (Daniel Grao), Antía’s father and Julieta’s husband. However, there are times grief doesn’t bring people closer, it drives them apart, as is the case with these two. Julieta doesn’t quite know this just yet, until she realizes that right after she turns 18, Antia gets up and leaves her mother, without a simple explanation, rhyme, reason, or even a clue of where it is that she might have gone. Julieta, like so many other mothers in her position, is obviously distraught and tries whatever she can to find her daughter and, hopefully, bring her back home, where she rightfully belongs. But as this journey goes on and on, Julieta realizes the painful truth that maybe, just maybe, she didn’t know much about her daughter to begin with. Julieta is an odd movie for Pedro Almodóvar to write and direct, because while watching it, it’s hard to think of it as a movie that’s coming from him. Sure, there’s chunks of melodrama, a lot of female characters, and of course, plot twists that seem to come out of nowhere, but at the same time, it still feels like an everyday, normal melodrama about a mother, a daughter and all of the other missed connections families have with one another. In other words, Julieta is a “safe” movie and probably the safest I’ve ever seen from Almodóvar, which is neither a good thing, or a bad thing. But unfortunately, it’s a thing that keeps Julieta from really working as well as it probably should have. Once again, it’s nice that Almodóvar is giving us a story about women, when so many other writers/directors would shriek at the idea of doing such a thing and it’s also nice that Almodóvar is able to wrangle out such good performances from this cast. Emma Suarez as the older-version of the title character is probably the best here, because she has to go through a whole bunch of emotions – most of them sad – but never seeming boring. There’s just something about her presence, as sad as it may be at times, that makes her watchable and take over this movie every chance she gets. That said, the rest of the movie isn’t quite helping her out. For one, it seems like Almodóvar himself sort of realized that he wasn’t working with that meaty of a story; there’s a mystery here, but mostly, it’s all tucked in the back so that a bunch of people can cry, get sad, and go on and on about their emotions. In fact, these characters here talk so much about their emotions, that it makes me wonder if they ever had anything else on their mind, like I don’t know, sports, the weather, politics, or hell, just anything else about how they feel? Probably not, but hey, it’s an Almodóvar flick so of course, this is to be expected. But what’s different about Julieta is that, when it’s not constantly jumping in-and-out of its narrative from past, to the present, it’s giving us a story that just doesn’t feel all that compelling in the first place. From what it seems, Julieta is just another mother confused and worried about her daughter – one of whom who just seems like a brat that, honestly, Julieta herself may be better off without. It’s an odd thing to say, I know, but it’s what kept going throughout my mind the whole time I was watching this and thinking of where this story was going and whether or not any of it was going to matter in the end. And honestly, it kind of doesn’t. 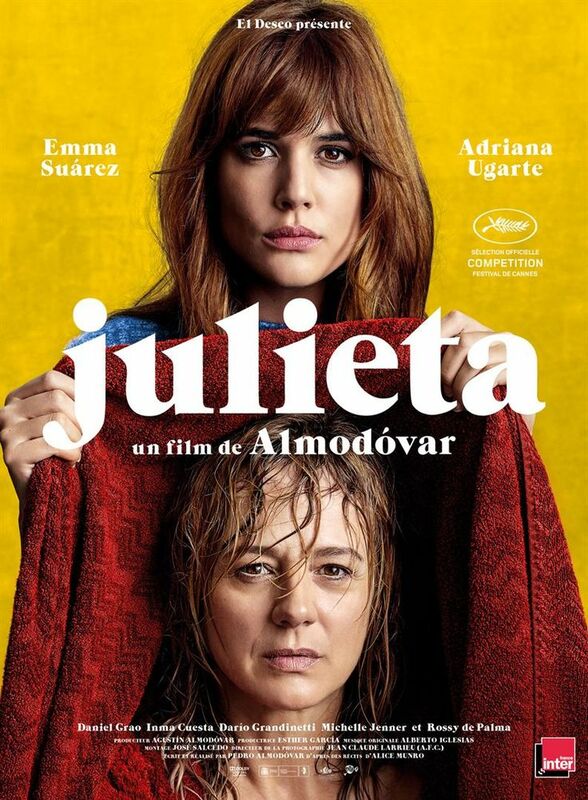 Julieta may show us that Almodóvar is able to restrain himself again and take a bit of a chill-pill when it comes to his story-telling (especially after the crazy and wild one-two punch of the Skin I Live In and I’m So Excited), but it also proves to be his most boring movie by a long shot. Sure, there’s certain aspects surrounding it that can be admired, like the previously mentioned characters, or the colorful look of it all, but when you get right down to the meat of it all, it just doesn’t quite hit hard. It feels like there may have been a real juicy, compelling, emotional and exciting story somewhere in here, but it doesn’t quite seem to come out. And for Almodóvar, that’s at least, a problem. Consensus: Not necessarily bad, as much as it’s just a bit of a bore, Julieta highlights Almodóvar’s knack for telling a laid-back story, but never quite giving it the right amount of heart, or energy it seems to need. Oh, man, the 80’s! What a crazy time! I mean, just look at that ‘do! There seems to be a real divide in how men and women react to this movie. I think it’s beautiful. The beginning and ending were especially impressive. Most of my female friends loved it. But most of the men I know agree with you and report being bored or annoyed by it.